Water. Just How Important Is It? Inside my new book Healthy and Free! I’m heading off on a mini vacation this week but before I left I was interviewed by a friend about my new book, Healthy and Free which releases November 17th (You can pre order it here). I’m so excited about this one, the book is straight from my heart and journey, and the interview is below so you can get a little window into the book! “Beni, thanks for sitting down and talking with us about your new book, Healthy and Free! 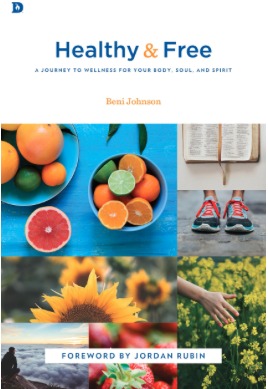 A lot of us have been watching your health and wellness journey for a while via social media and we are so excited to read the whole story and pull from your wisdom… I know it’s going to be an inspiring and empowering read. Going back to the beginning, where did the idea for the book come from and what first made you want to turn your own journey into a book? BJ: Well this has been a journey for me! It started about 10 years ago and in that time I’ve experimented, sought a lot of help and tried so many things. At the end of the day though, I wanted to help people realize that it’s not actually hard to get well. It can seem daunting but it doesn’t have to be. I also began to notice that so many people are sick, too many people. We started doing health classes at church and the response was huge, so many people have no education on living healthily. I wanted to give people a place to start, to make it simple and accessible for anyone to start their own journey. Obviously this book covers a lot of different material but what’s your main goal for someone reading the book? What can we hope to draw from it from it as we read? BJ: We are created as triune beings, body, soul and spirit, and I want to help people see that and help them bring that revelation into their life journey. God cares about all of who we are and He wants us to be healthy in all three. When we understand His care and involvement in not just part of us but all of us body, soul and spirit, it changes how we see health and our own journey. I want this book to be a place to start, or an encouragement along the way. When you were dreaming up this book, who were you wanting to see diving in and reading, who did you write it for? BJ: Healthy and Free is for everyone! If you’re looking for a ‘how to’ book this will be that book for you. Even if you haven’t taken a single step yet, or maybe you’re not sure you even want to… this book is still for you. And then, if you’re a healthy person or you’ve started your journey, it will encourage you, we all need to stay motivated and inspired! The forward to the book is by Jordan Rubin and you mentioned on Instagram that you were really excited about having him involved. How has he played into your health journey and what about him inspires you? BJ: Jordan’s book, “The Maker’s Diet” was the first book I read about living a healthy lifestyle. I read it from cover to cover and I loved it. Since reading it, I’ve read many other books of his. Jordan’s story of his own pursuit of healing was so inspiring to me. He was pretty much on his own and dying, no one could help him but he started on a journey and found what would heal his body. I love that. Ok so let’s be real, sometimes being healthy just doesn’t feel easy! Is there are part of living healthily that’s tough for you, and how do you deal with it? BJ: For me it’s eating out. We’re on the road a lot and that’s a big part of our lives. I’m pretty picky so finding out what’s out there to eat that’s also not full of toxins can be really hard! Sometimes you find things and it works, and sometimes you just have to give yourself grace and fix it later. Most of us who have tried to get healthy have had moments where we feel like we’ve failed with health, or just had a bad day. Do you have a particular weakness that can get you down in the journey, and what do you do in those moments to stay encouraged? BJ: I think for me the main frustration comes in dealing with hormones and trying to manage balancing them. When I know I’ve done all that I can do and then something out of my hands happens, that hard. Maybe for some reason my cortisol levels go crazy, I feel like I just took two steps back. When I hit that moment I stop and take a deep breath and tell myself, “you are going to be alright” and I just keep going, but all the while learning how to make it better. I know one of the issues that lots of people face in getting healthy is thinking that it’s really expensive. Do you think that’s true and what advice can you give to help us when we’re trying to be healthy but we’re also sticking to a budget? BJ: Well, yes it can get very expensive. But equally, it doesn’t have to break the bank to make some changes that will really help you! So, I encourage people to do what they can. Take baby steps. You don’t have to do everything at once, start with what works. What is one healthy thing you can do first? Start with something achievable and sustainable like maybe switching from conventional milk to organic milk. Some parts of getting healthy are even totally free. Getting out and walking or drinking more water… both totally free, or for some people switching to water might even save you money! Another thing on money though, and this might be harsh, but it really is the truth. You can pay a little bit more now to invest in your health, or you will pay the doctor later. And that’s a lot of money to pay. See the money that you spend not as an expense but an investment. You’re investing in something really worthwhile. We all love your Instagram flex pictures! Will tell us a bit about the workout DVD that goes with the book and what the workouts entail? BJ: Yes! There are 3 DVDs that you can get to go with the book. None of them are full workouts but they’ll all help you get started and incorporate exercise into your life. The first one is in the gym with my trainer. He shows us how to use the gym by taking me through some of the equipment and showing us how to do the exercises the proper way. The second one is the same but in my home to find ways to workout without leaving the house, and the last is at the park so mums and dads can work out at the park while the kids play! There are ways for everyone to get moving! Ok so no excuses on getting moving then! And finally, I know you’re passionate about the whole message of the book, but is there a chapter that was your favorite to write?! BJ: Oh yes. The Art of God. It’s about the revelation that God saved the best for last when He created us, and realizing that we are each a beautiful piece of art. It’s a revelation that will change you. With that comes the realization that it is then our responsibility to take care of us, of what He so beautifully created. It makes you treat yourself differently. So, stay healthy body, soul and spirit. I so excited to hear about your new book! Can’t wait until it comes out! Beni, I’ve already pre-ordered copies-very excited to glean from your experiences, revelations and wisdom. GOD is so good! just wondering how many hours a day you spend on working out, eating right, thinking about your health, reading about health and health trends and thinking about your body, food, and health? just curious.. I have no idea. I think about the whole body soul and spirit. I’m pretty passionate about helping people live a healthy life. Order Your Copy of Healthy and Free! Healthy and Free is now available! Just click on the image above to find it on Amazon.